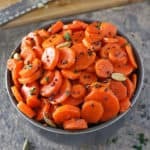 This is a sponsored post written by me on behalf of Foodie Tribe and FAGE Total Greek Yogurt. All opinions expressed are my own. Thanks so much for supporting the brands that keep this blog spinning. 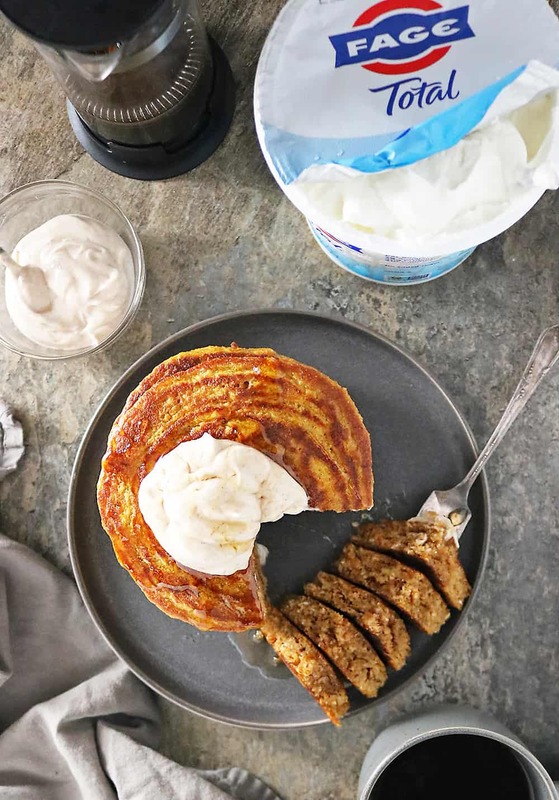 Whip up and enjoy a stack of these easy, gluten free, Pumpkin Greek Yogurt Pancakes gently spiced with pumpkin spice because ‘tis the season for pumpkin joy! Last night my daughter and I got home ravenous. So, after going through all our pantry and refrigerator options, I decided to whip up a stack of pancakes. 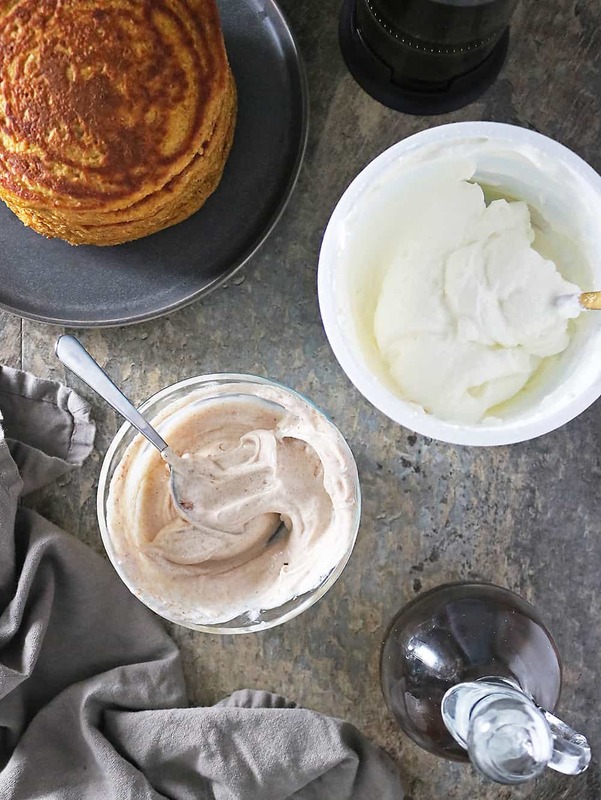 As Oatmeal pancakes are a favorite with us gals, I decided I’d go with them – besides they are so easy to whip up and the ingredients are always lying around in our pantry. As I had some leftover pumpkin puree I figured I’d jazz up those Oatmeal Pancakes and make them into Pumpkin Oatmeal Pancakes. Just as I was getting ready to whip those up though, my daughter started blabbing about some Yogurt Pancakes I once made, so I figured why not combine pumpkin and Greek yogurt? Since I had several containers of all three fat varieties of FAGE Total Greek Yogurt already on hand, I opted to use FAGE Total 5%. I find FAGE Total to be so thick, so rich, so creamy and so versatile. 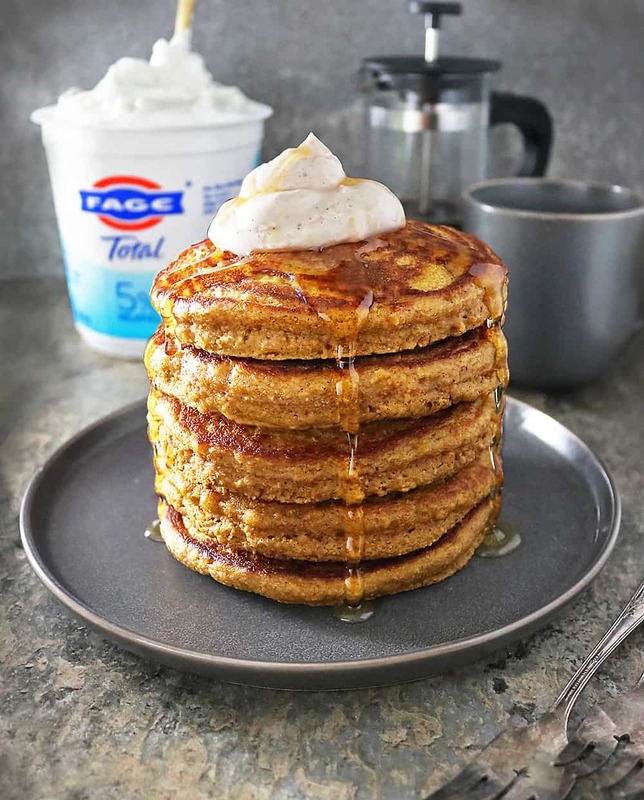 I not only enjoy FAGE Total with Apple Walnut Granola in the morning but also in curries and baked treats, and now, in these Pumpkin Greek Yogurt Pancakes and an accompanying Pumpkin Cream. My daughter says that pumpkin cream should be called a pumpkin frosting. But, her opinion might be a bit skewed as for her first three years of life I convinced her that FAGE Greek Yogurt with a smidge of maple syrup was ice cream! Of course she went to a friends’ 3rd birthday party and found out what ice cream really was… but parenting score for those first three years!!! By the way, did you know that FAGE Total is available in 3 sizes to fit your needs? There’s the single serving cup (6 or 7oz. ), a 17.6oz. container, and a 35.3oz. tub. FAGE Total is also available in three fat varieties to fit your lifestyle: FAGE Total 5%, FAGE Total 2% and FAGE Total 0%. 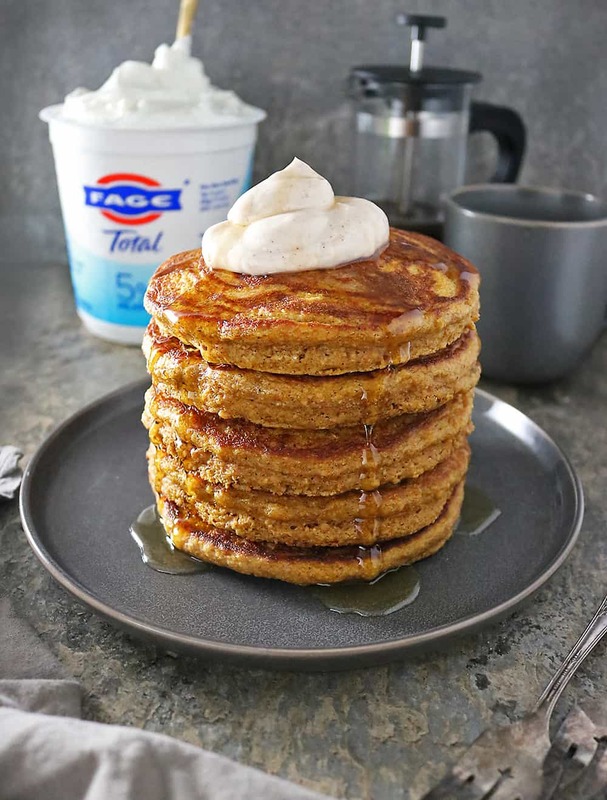 Last night, after we had feasted on a couple of these pancakes each and were sitting around all full and satisfied, my daughter said that adding that FAGE Total into these Pumpkin Greek Yogurt Pancakes made these so luscious – almost cake like. 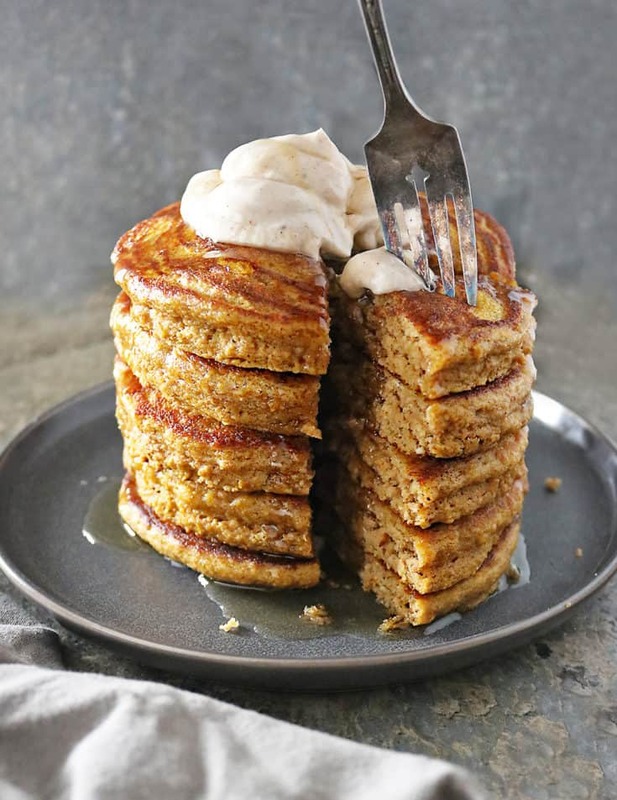 And, I’ll take cake for dinner anytime… especially when it’s in the form of these nutritious and delicious, gluten free, pumpkin-pie-spiced, Pumpkin Greek Yogurt Pancakes! Add the rolled oats to a blender or food processor and process until resembling flour. Then add oat flour to a bowl. Add in the pumpkin pie spice, baking powder and salt and mix well with a wooden spoon/spatula. In a separate bowl, beat the two eggs. Then make a "well" in the dry ingredients and add eggs to oat mix. 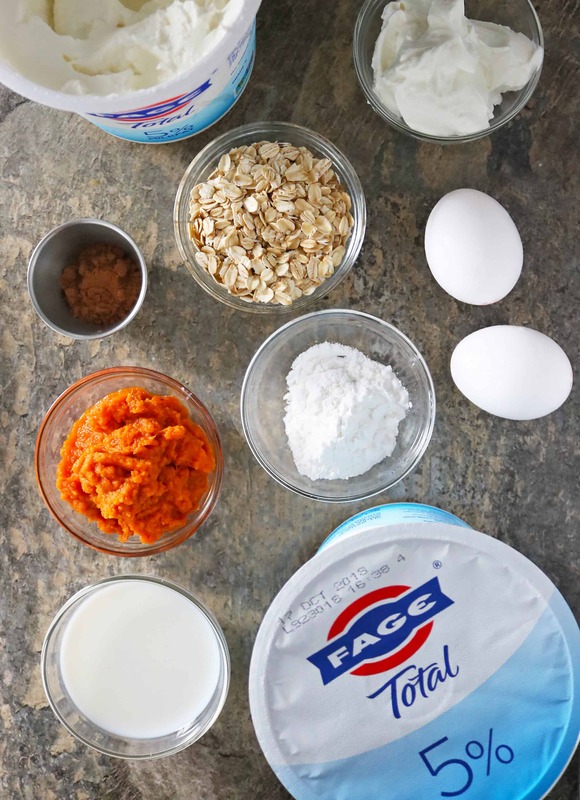 Also add in the pumpkin puree, FAGE Total, milk and maple syrup and mix until wet and dry ingredients are incorporated. The mixture will be thick and will continue to thicken but, I have come to realize that the thicker the mix, the higher the pancakes. 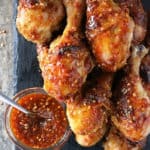 Grease a pan with oil or butter and place it over a medium flame/heat. When pan is hot, drop 3-4 tablespoons of pancake batter onto it. Cook about 3-4 minutes and then flip and let cook another 3-4 minutes on other side. Finish the rest of the batter in this manner. You should have 6 large-ish pancakes or 10 medium to small size ones. The pancake batter will start to thicken through the process, but you don't need to add more milk or water - as I have found that the thicker the batter, the higher the pancakes. I’d gladly take cake anytime, too…especially if it counts as dinner! I’m all about the pumpkin flavors right now, and a good pancake is hard to beat. 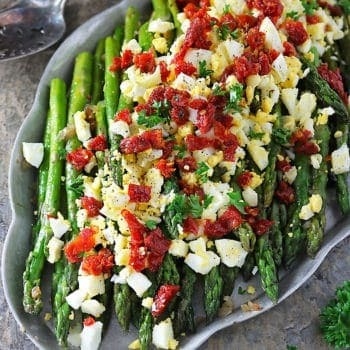 Actually, breakfast for dinner is one of my favorite meals…so I need to put that on the agenda! We always keep FAGE in our fridge, too, so I’m pretty sure I have all of the ingredients for these pancakes. 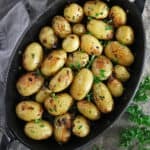 They look delicious!! Sign me up for these tempting pancakes. They look fluffy and light — thank heaven it’s almost the weekend! These pancakes look so fluffy and perfect. 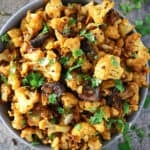 Love the addition of the yogurt and pumpkin to make these exciting and different. These are so fluffy and perfect! Definitely a great way to start any morning. 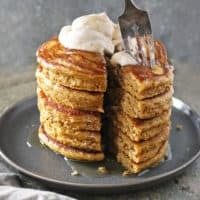 I love everything in these pancakes and the fact that they are pumpkin is another bonus! Breakfast for breakfast, lunch, or dinner is my motto. And pancakes are a favorite. Love the change-up on these, a must try. Thanks! Nice pancakes! 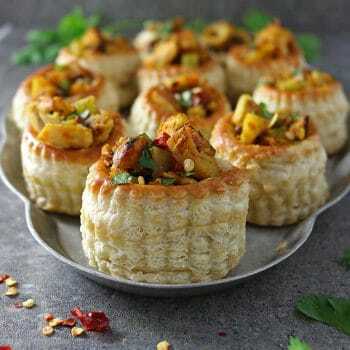 The oat flour based cakes sound wonderful and I’m sure very tasty. But, what really impressed me was how uniform your pancakes were. We don’t have pumpkin spice available here so I have to make my own. I have a butternut squash setting on our kitchen counter that just got chosen for your pumpkin yogurt pancake recipe. Beautiful. I used to make pumpkin pancakes when my kids were growing up. They had no idea they were eating squash!